Jaguar's fresh-design XK will be available in coupe and convertible models, priced at $75,500 and $81,500 respectively. Fast, powerful animals have been prowling South Africa for eons, but the most awesome of these creatures is a new breed of cat - 2007 Jaguar XK. It has unleashed on roadways near Cape Town in coupe and convertible forms, with slinkier bodies, more muscular engines and enhanced agility. Base priced at $75,500 for the coupe and $81,500 for the convertible, the Jaguar XK takes a giant leap forward in design and engineering. Two cars in one - both a sports car and Grand Tourer - is the Jaguar's description of the XK. It does not take long behind the wheel to validate this dual-identity claim. Wide roads, sweeping form mountainous regions to seacoasts, were well-suited for both XK's performance and cruising characters. Weather, too, ranging from the mid-60's to 80 degree Fahrenheit, was a natural for open-air driving - made convenient with the convertible's soft top that powered down in 18 seconds. The design of the Jaguar XK is just right with a combination of "lips and hips". Vintage Jaguars from the 1950's and 1960's were strategically placed around the new XKs in the test-drive staging area to punctuate Cullum's view that it's fitting to group the XK's styling with great "inspirational" cars of Jaguar's past, such as the XK120, and C-, D-, E-types. Each of these cars represent and express the essence of Jaguar, and the new XK's design runs with this pack because of its timeless looks - tautly wrapped skin, long hood and ground-hugging proportions. The design process for both models started with the convertible vs. creating a coupe and slicing off the top. It was a must that the body have "no fat." The lean form chosen worked well with the coupe's swept roofline. Both models were created with a poised look, achieved by stretching the wheels toward the corners to leave minimum overhangs. Elegance and muscularity were emphasized by sculpting an "all-shoulder" rear end and power-bulge hood, as well as incorporating front-fender power vents, and Jaguar's signature oval grille. Inside the sleek all-aluminum skin is a clean interior, contemporary space where everything fits together perfectly. The 2 + 2 interior isn't ostentatious but a minimal and simple execution - an interaction of beautiful surfaces and finishes crafted from wood, leather, and aluminum. Use of aluminum goes beyond what the eye sees. The Jaguar XK's Lightweight Vehicle Technology features an aluminum monocoque structure that lowers weight and increases strength. Compared to their predecessors, the coupe is 108 pounds lighter and 31 percent torsionally stiffer, and the convertible has shed 221 pounds and gained 48 percent stiffness. Less weight and a more powerful engine is good news to performance enthusiasts. 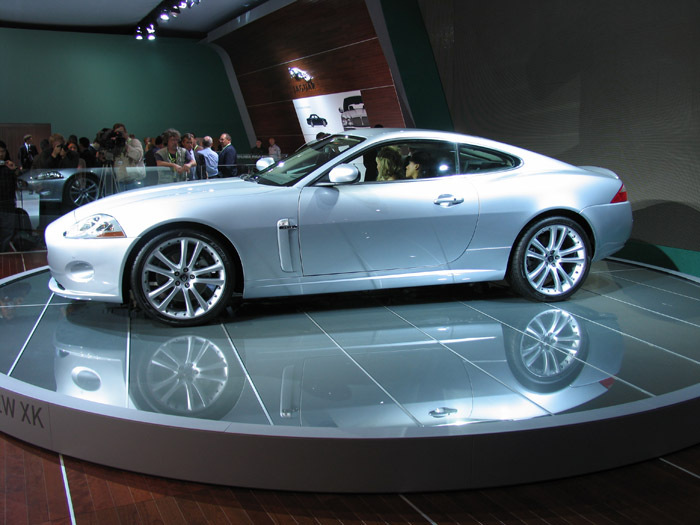 The Jaguar XK muscle is provided by a 4.2-liter engine that delivers 300 horsepower and 310 foot-pounds of torque. Mated to a six-speed, sequential shift automatic transmission, the Jaguar XK goes from 0-60 mph in 5.9 seconds and through a quarter-mile time in 14.4 seconds. This quarter-mile time is within a half second of the 2006 supercharged Jaguar XKR's. Putting the foot into the pedal coaxes an old-school European sports-car roar. 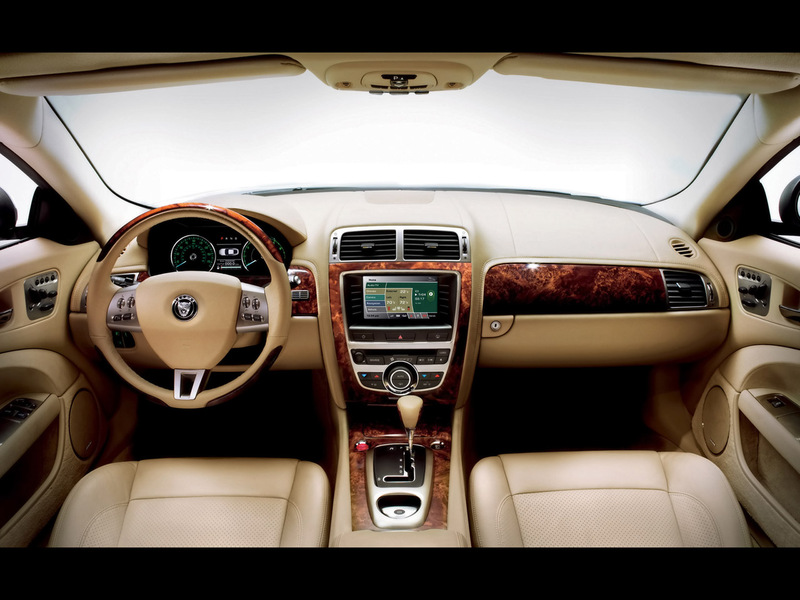 Level off to cruising speed and the XK gets luxury-car quiet. The sequential shift automatic is a food match with the Jaguar XK's two-cars-in-one character. It can be driven in traditional automatic "D" mode or manually shifted by buttons mounted on the steering wheel spokes. A tap on either button - left one downshifts and right one upshifts - instantly puts the transmission in manual mode. Stop manual shifting and the operation reverts to automatic mode. The Jaguar XK is a total confidence car, providing on-tap passing power; quicker on-center steering; and outstanding stability that's shows its stuff in tight, aggressive cornering. Computer Active Technology Suspension adaptive damping keeps body roll in check and Dynamic Stability Control controls yaw (spin on a vertical axis), and wheel slip via engine torque and brake control. While the Jaguar XK's technology does spoil you a bit, it is not so over-teched that you lose the sports car feel. As Jaguar says the purpose of the technology is to "empower not overpower."